“Soyez mysterieuses”—be mysterious—Gauguin said. Perhaps he had this command in mind when he produced the most significant painting—by his own reckoning—to come out of his first stay in Tahiti, The Spirit of the Dead Watching. Few critics would doubt the importance of this work. 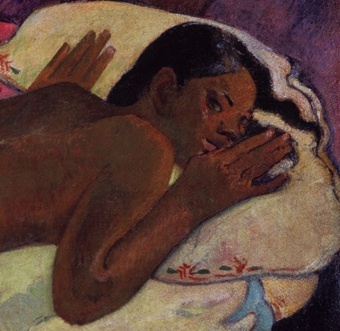 Its mysteriousness and openness to interpretation has secured for it a position among Gauguin’s key works. 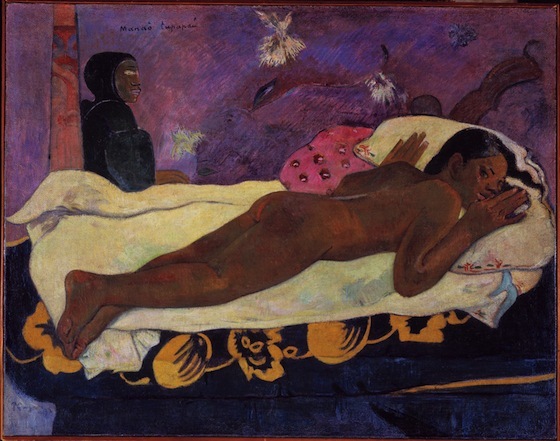 Gauguin created a haunting, supernatural quality by exploiting what he considered to be the emotional potential of color. When describing the painting to Mette, he points out how the shades of purple on the wall create “a background of terror” and how the sheet “must be yellow, because, in this colour, it arouses something unexpected for the spectator.” Using colors to arouse feelings was very much in line with the work of other Post-Impressionist artists, such as Gauguin’s contemporary and friend, Vincent van Gogh. Aside from color, the composition is itself unsettling, particularly the relationship between the girl and the old woman behind her whose simplified form and disproportionate scale suggest Tahitian statuary or tiki. If she is a carved statue of wood, though, what or who does it signify? If not, then is she real or otherworldly? Is this the spirit of the dead watching that the title refers to? And if she is imagined, then by whom? Is all that surrounds the girl the conjurings of her own haunted imagination? Or is it what she looks out at—the space we ourselves inhabit—that is the source of her terror? Could it be, then, that we are the spirit of the dead watching? The Tahitian language certainly allows for such ambiguities. The expression, manoa tupapau means either watching the spirit of the dead or the spirit of the dead watching. Figure 2. Manet, Olympia, 1863 (left) and Gauguin, Spirit of the Dead Watching, 1892 (right). Click for a larger view.